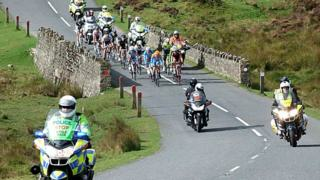 The 2020 Tour of Britain will begin with a 105-mile first stage in Cornwall. Britain's biggest professional cycle race will see 120 riders start in Penzance and finish in Bodmin. The 170km stage is also due to include St Ives, Redruth, Falmouth, Truro, and the Eden Project, with organisers hoping for 180,000 spectators. Independent economic reports estimate the event will generate more than £3m of extra spending in the county. Image caption Former pro-cyclist Chris Opie, said for spectators to witness athletes at the top of their sport could be "life-changing"
The race, which is passing through Cornwall for the first time after previously touring the sites of Devon, will kick off in September 2020. Adam Paynter, leader of Cornwall Council, said: "This is fantastic news for Cornwall. "It will help to enhance our profile both at home and abroad. "We will also work to ensure we create a long-lasting legacy from the event by raising the profile of cycling in Cornwall and motivating more people to get on two wheels and lead healthier, more active lives." The Tour of Britain is broadcast in 190 countries worldwide. Former professional cyclist Chris Opie, from Truro, said: "The chance to witness the world's top athletes competing in one of the world's toughest events right on their doorstep, enabling a generation to dream and to aim for exciting, ambitious goals, could be genuinely life changing." Mick Bennett, Tour of Britain Race Director, said: "A lot of hard work over a sustained period has gone into today's news, which we know will excite sports fans in Cornwall and across Britain."